Yesterday morning, I parked at Galloway Golf Course to go jogging, and, LOOK who I met! Pat Neely, from the FOOD NETWORK hit show, DOWN HOME WITH THE NEELY’S. He was extremely NICE and, this show is one of my favorites on Saturday mornings. The Neely’s live in Memphis and, their food is INCREDIBLE! Check out their local restaurant: NEELY’S. Pat chicken dry with a paper towel and season with salt and pepper. Brown the chicken, meat-side down first, and turning once, about 4 minutes on each side. Transfer to a plate to reserve. Add onion to the pan and saute until tender, roughly 3 minutes. Add the stock and wine and stir, scrapping any brown bits off the bottom of the pan. Turn heat to high and reduce by half, about 3 minutes. Pour in the crushed tomatoes and add the dried herbs and lemon pepper. Add the chicken thighs back into the pan.Cover and cook on medium-low heat for 40 minutes. Remove chicken from liquid and serve on hot buttered rice. Ladle the sauce on top and garnish with fresh chopped parsley. 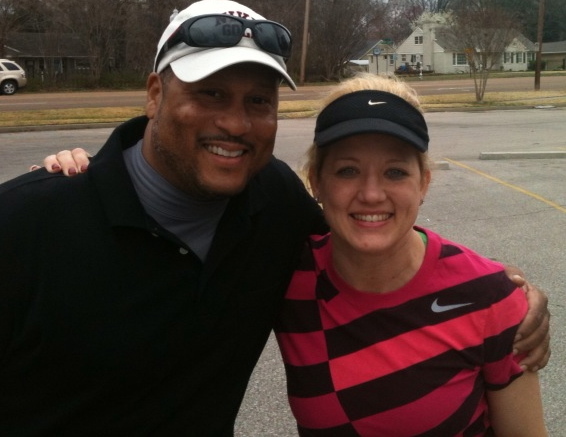 VERY NICE TO MEET YOU PAT NEELY! I am a fan!